For the sixth semester in a row, student enrollment for higher education has declined in the United States. According to the latest report from the National Student Clearinghouse Research Center, spring 2018 numbers decreased by 1.3 percent from the previous spring. That follows a 1 percent drop for fall-over-fall enrollment. Four-year for-profit schools saw the biggest decline (6.8 percent). However, that's the smallest enrollment reduction over the past six semesters for the sector. 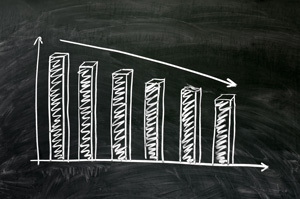 Two-year public institutions experienced a 2 percent drop, followed by four-year private nonprofits (0.4 percent) and four-year publics (0.2 percent). The overall dip across all types of institutions was just under 1 percent (0.9 percent). These numbers are derived from data reported by Title IV, degree-granting institutions. The estimates are published each May and December by the research center and provide national enrollment estimates by institutional sector, state, enrollment intensity, age group and gender. Total enrollment across all sectors reached 17.8 million students for spring 2018, down from 18.1 million in spring 2017. Unduplicated headcount shrunk from 17.7 million to 17.5 million over the same period. When calculated by age groups, the greatest reduction across all sectors for first-time college students was among those aged 24 and older; that segment sunk by 13.3 percent, compared to 5.4 percent for those 18 to 24 years old. National enrollment for all students 24 and older shifted downward by 4 percent, while those 18 to 24 saw just a 0.4 percent reduction. The number of women enrolled in higher ed (10.3 million) exceeds the number of men (7.6 million), and both groups saw loss: 0.8 percent for female students and 1.9 percent for male students. As for program categories, some STEM fields showed their staying power. Among instructional subjects, "science technologies/technicians" grew by 6.5 percent spring-over-spring, reaching 7,817 individuals. "Computer and information sciences and support services" rose by 3.7 percent, encompassing 423,315 students. "Communications technologies/technicians and support services" grew by 2.7 percent to 18,844 people. "Biological and biomedical sciences went up 2.7 percent, drawing a total of 579,302 students. And engineering grew by 1.6 percent, reaching 568,243 students. The complete results for spring 2018 are available on the research center website.